A #1 national bestseller—“A yarn so packed with suspense, romance, literary reference, fascinating miscellaneous knowledge, and heart that only Stephen King could have written it. Marvelous—that is, full of marvels” (Booklist).Since his wife died, Ralph Roberts has been having trouble sleeping. Each night he wakes up a bit earlier, until he’s barely sleeping at all. During his late night walks, he observes some strange things going on in Derry, Maine. He sees colored ribbons streaming from people’s heads, two strange little men wandering around town after dark, and more. He begins to suspect that these visions are something more than hallucinations brought on by lack of sleep. There’s a definite mean streak running through this small New England city; underneath its ordinary surface awesome and terrifying forces are at work. The dying has been going on in Derry for a long, long time. Now Ralph is part of it…and lack of sleep is the least of his worries. Returning to the same Maine town where It took place, a town that has haunted Stephen King for decades, Insomnia blends King’s trademark bone-chilling realism with supernatural terror to create yet another masterpiece of suspense. Book Description A #1 national bestseller-"A yarn so packed with suspense, romance, literary reference, fascinating miscellaneous knowledge, and heart that only Stephen King could have written it. Marvelous-that is, full of marvels" (Booklist). Since his wife died, Ralph Roberts has been having trouble sleeping. Each night he wakes up a bit earlier, until he's barely sleeping at all. During his late night walks, he observes some strange things going on in Derry, Maine. He sees colored ribbons streaming from people's heads, two strange little men wandering around town after dark, and more. He begins to suspect that these visions are something more than hallucinations brought on by lack of sleep. There's a definite mean streak running through this small New England city; underneath its ordinary surface awesome and terrifying forces are at work. The dying has been going on in Derry for a long, long time. Now Ralph is part of it...and lack of sleep is the least of his worries. Returning to the same Maine town where It took place, a town that has haunted Stephen King for decades, Insomnia blends King's trademark bone-chilling realism with supernatural terror to create yet another masterpiece of suspense. Editorial Reviews From Publishers Weekly Forget the lean, mean King of Misery, Gerald's Game and Dolores Claiborne. This is the other King-the Grand Vizier of Verbosity who gave us It, The Tommyknockers and Needful Things. There's much of everything in these 800 pages, including the worthy. Notable is a rare septuagenarian hero, recently widowed Ralph Roberts, whose broodings on old age immerse readers into the aging psyche almost as clearly as other King heroes have revealed the minds of children. Then there's the slam-bang final 300 pages, in themselves a novel's worth of excitement as Ralph battles demonic entities to prevent a holocaust in his small town of Derry, Maine (site of It). The problem is that the finale is preceded by more than a novel's worth of casual, even tedious buildup: Ralph's growing insomnia; his new ability to see auras around all living things; his dismay as Derry's citizens divide violently over the impending visit of a radical pro-lifer; his slow realization that celestial forces have marked Derry as a battleground between good and evil. 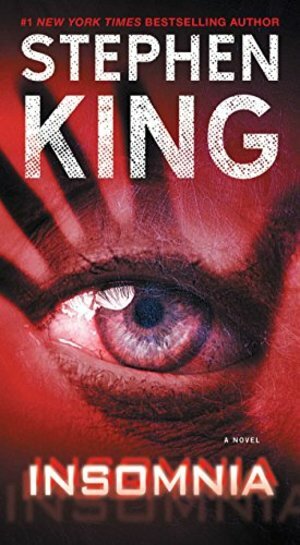 King remains popular fiction's most reliable mirror of cultural trends, in particular our continuing love affair with horror (Barker and Koontz are palpable influences here). If this novel were liposuctioned, it would rank among King's best; as is, it's another roly-poly volume from a skilled writer who presumes his readers' appetite for words is more gourmand than gourmet. 1,500,000 first printing; $1 million ad/promo; paperback rights to Signet; simultaneous audio release from Penguin Highbridge; BOMC selection. Copyright 1994 Reed Business Information, Inc. --This text refers to an out of print or unavailable edition of this title. From School Library Journal YA?Ralph Roberts has been waking earlier and earlier every night for weeks, and the forgetfulness and weariness caused by sleep deprivation are starting to affect him. When he begins to see brilliant auras around people and objects, his concern grows. As his nights become shorter, his visions become more terrifying, and yet more real. Strange forces are maneuvering for power in Derry, Maine, and somehow Ralph is a part of the conflict. Well-read students will note references to Greek mythology, the Bible, and to Tolkien's Lord of the Rings (Houghton, 1967) interspersed with modern cultural allusions. King's forte, however, is characterization, and there is no shortage of it here. Good guys and evil are well developed, with a depth that makes them believable. Although Ralph is clearly identified as a septuagenarian, he is never stodgy or prudish, and will appeal to teens. Some of King's more recent novels, such as Gerald's Game (1992), have been disappointing, but Insomnia is closer to It (1987) and Needful Things (1992, all Viking) in its suspense and entertainment potential. A good return trip to Derry, Maine. ?Robin Deffendall, Bull Run Regional Library, Manassas, VA Copyright 1995 Reed Business Information, Inc. --This text refers to an out of print or unavailable edition of this title.